The article from St. Kitts Warrior William reminded me that I hadn’t delivered the story on St. Catharines that I promised back in Part 6. GO Transit is coming to Niagara. St. Catharines MPP Jim Bradley and St. Catharines MP Rick Dykstra announced Sunday [April 5, 2009] $2.5 million in federal and provincial infrastructure funding to build four new park and ride GO bus stations in Niagara. 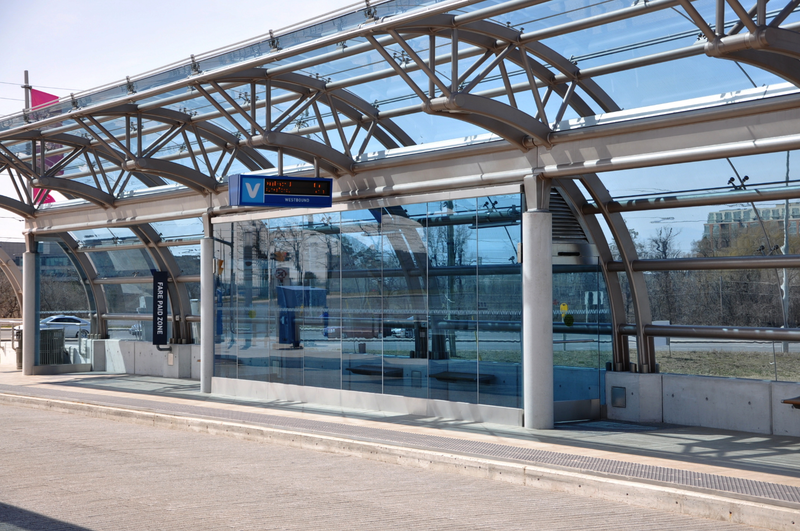 Construction on the first station at Casablanca Boulevard and the QEW in Grimsby will start in June, with service to St. Catharines and possibly two locations in Niagara Falls by September. Grimsby got a MASSIVE park and ride station, and smaller ones were brokered for Stoney Creek (Barton & Nash) and Niagara Falls (Hwy 420 & Stanley). Even though MPP Jim Bradley was Minister of Transportation at the time, St. Catharines got NOTHING — nada, rien, zip, zilch. 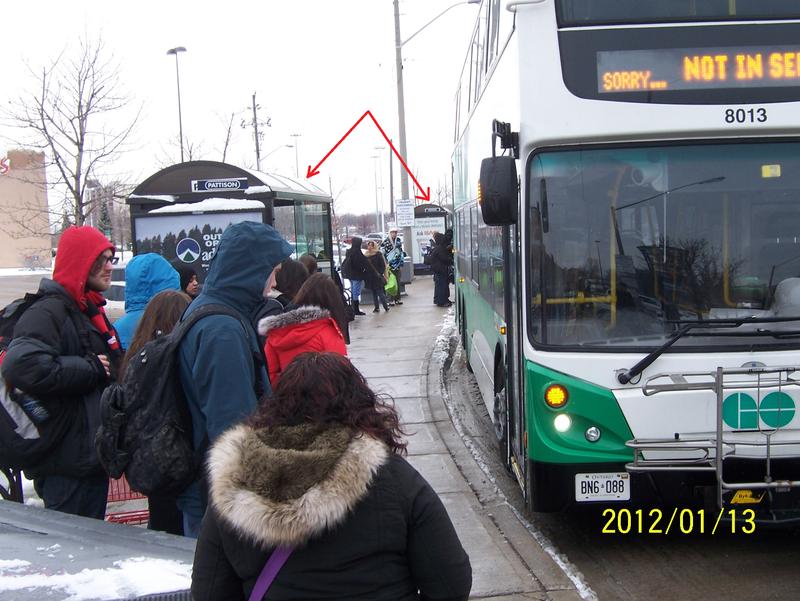 There is a Route 12 bus stop in the Garden City, but it’s not a Park+Ride station; it is located on YMCA Drive behind Fairview Mall. In reality, this is a St. Catharines Transit facility that GO Transit started using — much to the vexation of the local drivers. And why is that you ask? There are four local transit routes and two regional bus routes that stop there. 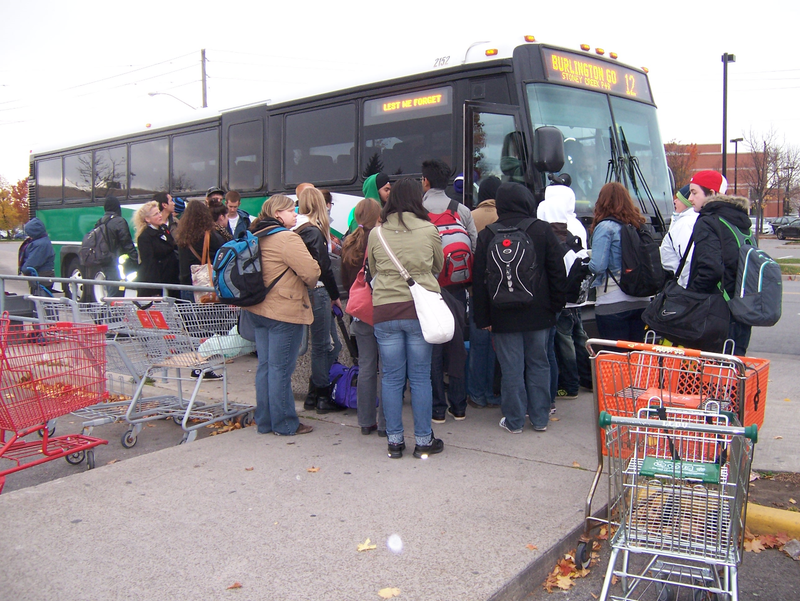 Add to that GO Transit’s regular Route 12 buses plus dedicated St. Catharines buses (12C and 12D), and the bus stop can become quite busy. There are safety issues to this congestion. The bus at the tail end of the queue sometimes has its back end sticking out into the traffic lane. Impatient bus drivers will “double park” their bus in the traffic lane and then discharge or take on their passengers. I’ve been at the stop to witness two accident investigations after the approaching local bus cut in too close and clipped the parked GO bus’ side mirror. It should be noted that even though The Falls receives all the publicity because of the demand for train service to Niagara, as well as the seasonal weekend train, it is St. Catharines that has carried Route 12 over the years. Metrolinx has invested no money to support this station. 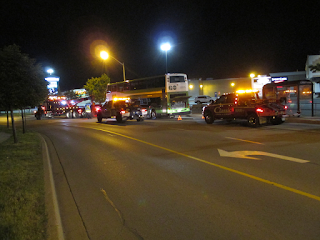 Intending passengers who drive to this location and leave their vehicles at Fairview Mall or the YMCA across the street, risk having their vehicles towed. It should be noted that this bus stop is NOT accessibility compliant. The bus shelters encroach on the minimum setback distance from the curb. GO Transit is aware of this deficiency and has known about it for some time — one of their staff who was tabulating passenger counts in 2013 told me. 1. Initially, timetables were taped to the bus shelter, but vandals kept ripping them down, which required repeated visits by staff from GO Transit Station Ops. 2. 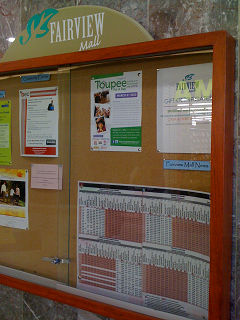 GO Transit’s solution was to hide the schedule inside Fairview Mall on the community bulletin board some 100 metres away — protected, yes, but of no value to passengers. 3. Next was a Plexiglas frame. Perfect! 5. 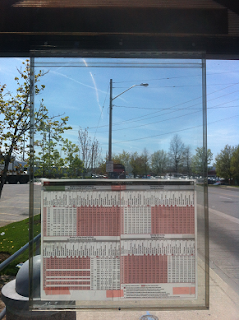 It was recommended that GO Transit acquire the same display case used by St. Catharines Transit. Voilà! 6. 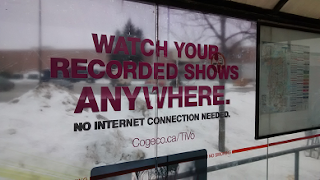 One day, the Route 12 timetable disappeared, replaced by a Cogeco advertisement, which vandals defaced promptly, and it, too, was removed. 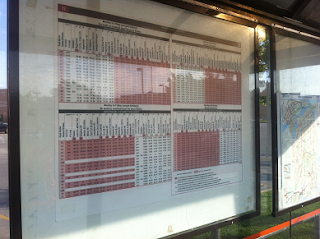 The mini-schedule for St. Catharines—Burlington—Union was posted near the pole with GO Transit signage, but Station Ops was challenged to ensure it was for the same board period as the main timetable inside the bus shelter. Eventually, GO Transit gave up posting any schedule in St. Catharines. 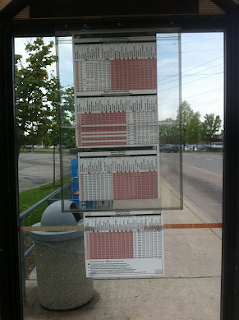 Some drivers would pick up a number of printed timetables at Burlington station and distribute them to passengers as required. To my knowledge this practice has stopped, too. What the Metrolinx Ivory Tower doesn’t realize is that passengers now pester GO Transit drivers for timetable information. Drivers do not need another delay departing this location! Many passengers, including me, have taken to downloading the PDF timetables from gotransit.com. However, as @KennyCBC noted on Twitter, GO Transit’s new website does not support PDF timetables. After some public pressure, GO Transit relented and made the schedules available. How did Metrolinx’s business analysts conclude that passengers would not need timetables — posted at the stop or as PDFs? The process of boarding is laborious, because drivers must sell tickets and load luggage (and give timetable information). Sometimes, if the timing is right, drivers who are Niagara-bound (or have a disabled bus) will sell tickets for Burlington-bound passengers in order to help their colleagues. 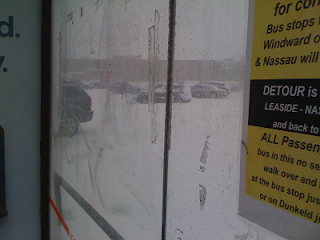 Report drivers dispatched to St. Catharines in cover buses are supposed to sell tickets, too, but many don’t. I recall one Niagara-bound driver, who after discharging his passengers on a busy Sunday afternoon, walked up to the cover bus, rapped on the door, woke up the snoozing driver, and chastised her for not selling tickets. When working Route 12, you better bring your “A” game. Save time and avoid the line - our upgraded ticket vending machines make using PRESTO even easier. Starting March 19, and over the next few days, we're upgrading the ticket vending machines at Niagara Falls Bus Terminal so you can instantly load your PRESTO card and check account information. One machine will be upgraded each day, so during this time you can use another ticket vending machine, or visit a GO or UP Express counter to buy your ticket or load your PRESTO card. You can also load your PRESTO card online at prestocard.ca or visit a PRESTO customer service outlet. We'll be sure to let you know once you can buy a PRESTO card or begin loading your card at the upgraded machines. Visit prestocard.ca/tvm to learn more. Niagara Falls already has a ticket agent!! Why does that location warrant ticket vending machines (TVM’s) — but NOT St. Catharines? 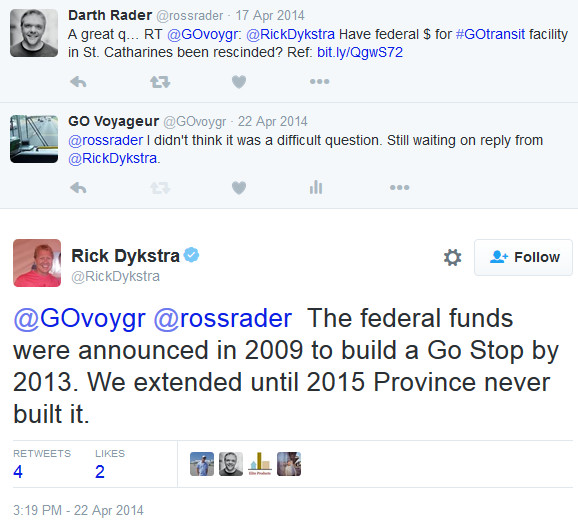 There was a need to offload ticket sales from drivers when GO Transit first came to town in 2009. 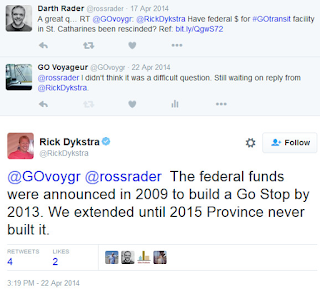 Now, nine years later, Metrolinx management still have their collective heads stuck in the sand on this matter. Cash management is a liability for the drivers and, hence, Metrolinx. Why? Ask GO Transit about the driver who was robbed of their cash receipts on the busy Friday afternoon of Thanksgiving weekend last year. Fortunately, no one was hurt in the incident, but what about the next time? In another incident, NRPS arrived at the stop one evening to remove Route 12’s roving drunk — let’s call him ^JM — from the bus. He had become so boisterous that he was offending fellow passengers. The officers emptied his “in progress” bottle of whiskey over the railing, then found an unopened bottle of Crown Royal in his bag, and emptied it, too. That brought tears to my eyes. My personal involvement in a police take down happened one Friday afternoon. A male and a female officer were trying to coax a distraught young female in the nearest bus shelter to come with them to face an allegation of shoplifting by a store manager in the mall. I walked up the bus platform, and was past the trio, when the officers shouted, “Stop!” I turned to see the young female bolting directly at me! As I whirled to get out of the way, my backpack caught her and knocked her to the ground; the officers were on her in an instant. With all this drama at the St. Catharines bus stop, why won’t Metrolinx install TVM’s there? Drivers have shared a multitude of stories for the status quo. One theory is that there is no electrical feed to the bus platform. This notion is incorrect, since St. Catharines Transit has a pole-mounted electronic display of their bus departures. There is a concern that the TVM’s won’t stand up to the vandalism at this location. It’s been suggested that Metrolinx strike a deal with Fairview Mall to place TVM’s in the foyer of the west entrance. This would provide some security for the machines when the mall is closed — not the optimum solution for drivers, but still better than the status quo. Apparently, mall management doesn’t support the idea. Why is there so much inertia to provide a proper bus stop in St. Catharines? It seems the politicians of Niagara region are fixated on only one thing when it comes to Metrolinx, namely, bringing the GO train to town. In this regard, the politicians will go to any lengths for a photo op. Recently, Jim Bradley was at the ground breaking ceremony for Centennial GO station, which is some 45 km. to the west and not in his riding. The earliest that GO train service can be expected in St. Catharines is 2023 — five years from now. Metrolinx has toiled longer than that on Burlington GO station. Do the local politicians really believe Metrolinx can deliver all the necessary passenger train infrastructure in five years? Assuming this can be achieved, it means at least another five years of hell at the Fairview Mall bus stop. And once train service begins, there will still be a need for bus service. Enjoy your sign residents of St. Catharines! TVM at the Fairview Mall stop was announced months ago. Still has not be installed. Do tell! To whom was that announced? I received two e-mails announcing TVM's at the Niagara Falls bus terminal, but nothing for St. Catharines.